Those factors, along with a growing belief that jurors are demanding more than just the testimony of paid mob informants, may have played a role in the not guilty verdict that appeared to shock Asaro as much as it did the prosecutors. "I couldn't believe it," the silver-haired wiseguy told reporters as he headed home a free man after spending two years in prison awaiting trial. While walking toward the car that would ferry him home, Asaro quipped to one of his attorneys, "Don't let'em see the body in the trunk." The anonymous jury deliberated for just two days after listening to three weeks of testimony and evidence that included mob turncoats, secretly recorded conversations and surveillance photos, all the tools that in the past have help convict major mob figures in cities throughout the country. The Justice Department boasts a conviction rate -- guilty verdicts and guilty pleas -- in more than 90 percent of organized crime cases, but the Asaro trial may be part of a trend in the opposite direction. The Times cited two other recent cases in federal court in Brooklyn in which mobsters walked and also pointed out that Thomas Gioeli and Dino Saracino, while convicted of racketeering charges, were found not guilty of more serious murder charges that were part of their case. Similar developments have played out in Philadelphia with mob leader Joseph "Skinny Joey" Merlino and five top associates acquitted of murder and attempted murder charges in 2001 even thought they were convicted of racketeering connected to gambling,, loansharking and the receipt of stolen goods. The difference was a potential life sentence as opposed to the eight to 14-year terms Merlino and his co-defendants received. Merlino subsequently beat a murder case in federal court in Newark as well. More recently, Philadelphia mob boss Joseph "Uncle Joe" Ligambi walked away after juries in two trials failed to convict him of gambling and extortion in a racketeering case that, like the Asaro prosecution, seemed to lack focus. His nephew, George Borgesi, and mob capo Joe Licata also were acquitted. Four other defendants were convicted. "I think those cases are just not as valued anymore," said Louis Natali, a defense attorney and professor of criminal law at Temple University Law School in describing the perceived mood within the Justice Department. "The emphasis today is on corruption and terrorism." What's more, Natali said, jurors bring a 21st century perspective to the courtroom. "On the scale of horrible things," Natali said, pointing to 9-11 and the most recent acts of violence in Paris, "Mafia murders aren't so horrible anymore." And when, as in the Asaro case, the murder charge dates back to 1969 and the robbery to 1978, jurors may question what is to be gained by prosecuting a senior citizen based on the suspect testimony of informants who, in many cases, have committed murders themselves and who are now perceived as paid government witnesses. "The case may have been stale," said Natali. "And his cousin was a rat. Jurors don't like that." Asaro's chief accuser, his cousin Gaspare Valenti, has been receiving $3,000-a-month from the FBI. He began cooperating in 2008 and made a series of tape recorded conversations with Asaro that were played at trial. A defense attorney called the payments an "FBI pension plan." "I think jurors are tired of serial cooperators," added Christopher Warren, the defense attorney who represented Licata in the first Ligambi trial and Borgesi in the second. "Juries are asking, 'Where's the beef?' They're questioning the currency and relevancy of events that are 20 or 30 years old." In an assessment that applied to both the Asaro and Ligambi prosecutions, Warren added, "These guys are yesterday's news." Another problem, said a lawyer who has worked both sides of the aisle, is the tendency of prosecutors to "over-reach" and to paint with broad strokes,. The lawyer, who asked not to be identified by name because any perceived criticism could be detrimental to future clients, said jurors expect more from the government that the testimony of cooperating witnesses who have cut a deal to get out from under their own problems. Valenti is one example. In the Ligambi cases, Louis "Bent Finger Lou" Monacello was another. Compare the Ligambi prosecutions, built around gambling and loansharking charges cobbled together as a racketeering conspiracy, to the prosecutions of mob bosses like Nicodemo "Little Nicky" Scarfo in the late 1980s and John Stanfa in the mid 1990s. Taking down the Mafia at that time was a government priority and the prosecutors assigned to those cases -- in Philadelphia lawyers like Joel Friedman, Louis Pichini, Barry Gross, Robert Courtney and David Fritchey -- were considered among the best in the office. Today, according to observers in both government and at the defense bar, the office's top prosecutors are working corruption, narcotics and terrorism. Those are the cases on which careers are now built. What's more, said several sources, the current administration in the U.S. Attorney's Office in Philadelphia has de-emphasized mob cases. "You can't go to war by yourself," said a former prosecutor who noted that while the FBI still has an organized crime squad committed to making cases against Cosa Nostra, if the prosecutor's office is less than enthused, those cases will never get in front of a jury. That was not the mood of the office in the 1980s and 1990s when federal, state and local authorities joined forces to dismantle the mob. More than 20 mob members and associates were killed during Scarfo's eight-year reign of terror as Philadelphia - South Jersey mob boss. His trial in the late 1980s included detailed testimony about a series of murders and attempted murders from shooters who carried out those hits and who led authorities to the weapons that were used. Scarfo and a dozen top associates were convicted and it is only now, nearly 30 years later, that some of those mobsters have been released and have returned home. Scarfo is not due to be paroled until 2033 when he will be 103. In the Stanfa case, the prosecution not only had the testimony and weapons of hitmen, but also dozens of highly incriminating tapes in which Stanfa, in his own words, implicated himself and his co-defendants in a series of murders and attempted murders. None of that was present in the two Ligambi trials. And very little of it existed in the Asaro prosecution. Surveillance photos show Asaro at mob social clubs, attending funerals and socializing with well-known gangsters like the late mob boss John Gotti. Where, in any of that surveillance, the defense asked the jury, do you see Vincent Asaro committing a crime, or doing anything wrong? The tapes made by Valenti hinted as mob activities and indirectly referenced the Lufthansa heist, but failed to provide definitive proof of anything. The Ligambi and Asaro cases, said Warren, were built around "a bunch of leftovers" that juries rejected. Goodfellas is a classic mob movie, one of the best and most realistic ever made. 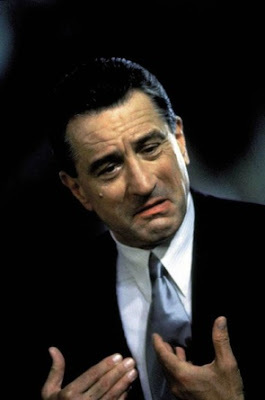 But the Goodfella case -- as the Asaro trial was billed -- never lived up to its hype. Warren ignores the fact those "leftovers" are no more guilty than the bums he represents. Let's see how many more trials he goes trying to make himself an Eddie Jacobs; it won't happen. It seems that all were convicted but two in that last trial; something sounds fishy there. However, you left out how when the subject of your latest book, John Alite testified against John A. Gotti in a major New York mob trial in 2009 the jurors said on live TV afterwards that Alite had zero credibility and was exposed in one lie after another under cross-examination. Something like that would have fit in quite well with this article, no? George A the bet is still on that Joe Ligambi will Die in Prison! Give It Time The Ratfellas Will Be Rating On One Other! !,,,,, Look At The History Of These Morons! yes your right they are known for rating! They can't do that either, can't even spell!! !